Students after SPM or O-Levels interested in a career in Aquatic Science can go for the 1-year Foundation in Science at Top Ranked UCSI University before continuing on to the BSc (Hons) Aquatic Science Degree programme for 3 years. Alternatively, students with at least 3 credits in SPM or O-Levels may join the Diploma in Aquaculture with Entrepreneurship before continuing on to Year 2 of the Aquatic Science degree programme. Students who have completed STPM, A-Levels, SAM, AUSMAT, MUFY, CPU, Foundation in Science or some Pre-University programme in Malaysia can enter directly into the BSc (Hons) Aquatic Science Degree at UCSI University with the relevant results. Established in 1999, UCSI University’s Faculty of Applied Sciences has distinguished itself as one of Malaysia’s leading hubs of scientific study. The Faculty of Applied Sciences wins multiple research grants each year. More than 60% of the Faculty of Applied Science staff are PhD holders. The Faculty stands out for the quality of academic teaching and research in Biotechnology, Food Science, Nutrition and Aquatic Science and is the Pioneer for these programmes in Malaysia‘s private higher education landscape. Graduates from the Faculty of Applied Sciences at UCSI University records a virtual 100% employment rate. A combination of a solid foundation in basic sciences such as mathematics, chemistry, physics, biology and statistics with an intensive training in organismal biology, ecology and evolution is a must for undergraduate students in aquatic sciences in Malaysia. The Aquatic Science degree programme at UCSI University has two specialisation options in Year 3, Aquatic Health and Management or Seafood Processing and Safety which will be used as the students’ research focus for their honours projects. Emphasis on theory, laboratory and fieldwork will ensure students are prepared for the demands of the working world. The BSc (Hons) Aquatic Science programme also plays an important role in nation building as it aims to support the government in conserving aquatic resources and providing training for industry personnel in the areas of research, development, management, production and conservation. found in aquatic environments. They usually spend their time teaching, gathering data, and conducting experiments. Biotechnologists – Use marine organisms to develop human medicines and other health aids. Environmental Planners – These professionals work with governments, as well as builders and other private companies to ensure that development does not encroach on fragile aquatic and wetland environments. Aquarists – They maintain exhibits at large public aquariums, while also teaching their colleagues and other interested people about aquariums and aquatic exhibits. Veterinarians – They help doctors take care of animals, and some of them specialise in the care of fish and other aquatic animals. Fish and Game Warden – They monitor wilderness areas, manage native species, and ensure that hunters and fishermen comply with state and federal laws (as well as any additional local regulations). Aquaculture Farmer – They raise fish and shellfish for a variety of uses such as food, bait, or breeding stock. Basic animal care, water quality maintenance, and personnel management duties may be a part of an aquaculture farmer’s responsibilities (both technician and management positions are available in the aquaculture industry). Food Scientists/Quality Control Inspectors – ensure that products (seafood) meet standards of quality and safety. EduSpiral helped me to choose the right course & university, and arranged my on-campus accommodation. Everything went smoothly. You will need at least 5 credits in SPM (inclusive of Mathematics and 2 pure science subjects) to join the Foundation in Science. After your Foundation in Science you can continue on to the degree programme at UCSI University. Students with STPM will need 3 principal Cs or A-Levels 3 principal Es in Chemistry, Biology & Mathematics / Physics. UEC students will need 5 credits (Bs) inclusive of Chemistry, Biology & Mathematics / Physics and 2 other subjects to enter into the degree. Established in 1999, UCSI University’s Faculty of Applied Sciences has distinguished itself as one of Malaysia’s leading hubs of scientific study. The Faculty of Applied Sciences wins multiple research grants each year. More than 60% of the Faculty of Applied Science staff are PhD holders. Lim Lai Huat, a senior lab technologist specialising in marine systems showing Dato’ Ng the facilities at UCSI University’s Aquatic Science lab. Graduates from the Faculty of Applied Sciences at UCSI University records a virtual 100% employment rate, the statistics show that this is indeed the case. University records show that around 40% of Applied Science students move on to sales and marketing upon graduation while others move into non-Biotech fields like quality control – a field that involves a great deal of chemical analysis – and Microbiology. The Faculty is home to intelligent and ambitious individuals who target a fast-track career in science. UCSI University’s students go beyond themselves in every endeavour and the Faculty provides them with myriad avenues to shine. The Faculty enjoys an impressive haul of inter-varsity awards and many of our undergraduate students steal a march on their postgraduate counterparts by publishing their research findings in scientific journals. Success is an integral part of the Faculty’s identity and character. As a premier university, UCSI University provides students with the option to complete their studies at UCSI or transfer to global partner universities in the Russell Group, Universitas 21 and The Group of Eight. With over 200 fields to choose from, the flexible IDP programme allows students to not only study in two countries for a fraction of the cost but also obtain a foreign degree. At the University, the International University Collaboration Centre assists students in all aspects of their IDP experience. Services rendered by IUCC include personalised counselling, university selection, course selection, university application, monitoring of progress and follow-up, accommodation arrangement as well as special pre-departure services, which include visa applications, air ticket arrangements and briefings. Students are also able to attend international education fairs and guest lectures, interact directly with university representatives, and have on-the-spot interviews. Building on its domestic standing as a preferred and trusted education provider, the University is also expanding its sphere of influence. Tie-ups with foreign universities, research institutes and leading multinational companies are constantly established, enhancing opportunities for students and staff in the areas of research and development, mobility programmes and career opportunities, among others. Biotechnology degree students at UCSI University may transfer to top universities overseas for the final part of their degree students such as the University of Queensland, Australia or Northumbria University, UK. The Faculty of Applied Sciences at UCSI University maintains two laboratories dedicated to postgraduate research. The Phytochemistry Laboratory house various instruments used to find, isolate, and identify novel natural products with medicinal value. The Malvern Zetasizer Nano ZS is the world’s most widely used system for the measurement of the size, electrophoretic mobility of proteins, zeta potential of colloids and nanoparticles, and optionally the measurement of protein mobility and microrheology of protein and polymer solutions. UCSI University’s Agilent 1200 HPLC system can be adapted for both analytical and semi-preparative isolation of natural products. It includes all the basic UV-vis HPLC modules and also other additional modules. These additional modules includes a column temperature control for high resolution separation at elevated temperatures and an auto-sampler for high throughput analysis. Agilent 7890A Gas Chromatograph is a robust analytical instrument used for the analysis of volatile chemicals. It has a wide range of applications including fatty acid analysis, flavour analysis as well as detection of certain food additives and pesticide residue. CAMAG High Performance Thin Layer Chromatography system is one of the most advanced of instrumental Thin Layer Chromatography systems available. Compared to conventional TLC systems, HPTLC includes a widely standardized methodology. Every aspect of the analysis from sample loading, band resolution and plate visualisation is conducted under properly regulated conditions to ensure high precision. Analytical methods are easy to develop and many natural product samples can be analysed simultaneously. The venerable preparative chromatographic column is present in all respectable phytochemistry laboratories. Conventional column chromatography provides the large sample capacity required to isolate compounds in large enough quantities for structural elucidation and bioactivity testing. UCSI University has a wide repertoire of chromatographic stationary phases ranging from traditional ODS and silica to newer MCI gel and Sephadex LH20. The LABSONIC® P homogenizer is designed for higher output up to 400 W and correspondingly for treatment of larger samples. Several liters can be sonicated in batch mode, whereas 10 to 50 L/h can be processed in continuous mode using a flow cell. The facilities available at UCSI University’s Molecular Biology Laboratory allows for the study of biology at the molecular levels. Their research team regularly conducts a wide range of basic and applied research activities including gene based, protein based and molecular based studies. The StepOne Real-Time PCR System is a 48-well, Real-Time PCR instrument perfect for both first-time and experienced users. Utilizing robust LED based 3-color optical recording, the StepOne Real-Time PCR System is designed to deliver precise, quantitative Real-Time PCR results for a variety of genomic research applications. The Gel Doc™ XR+ system is based on CCD high-resolution, high-sensitivity detection technology and modular options to accommodate a wide range of samples and support multiple detection methods. The system accommodates a wide array of samples, from large polyacrylamide gels to small agarose gels and various blots. The system enables image analysis and documentation of restriction digests, amplified nucleic acids, genetic fingerprinting, RFLPs, and protein SDS-PAGE. BioLogic DuoFlow Medium-Pressure Chromatography system is an FPLC system used to separate and purify biological molecules. It can be used for both preparative and analytical purposes medium pressure chromatography is typically used with columns that are not designed for the high pressures in HPLC instruments. Columns used with medium pressure chromatography typically include ion-exchange and affinity columns. FLUOstar Omega is a multimode microplate reader with five detection modes. It utilizes an ultra-fast UV/Vis spectrometer or filters for absorbance as well as highly sensitive filters for all other detection modes. The FLUOstar Omega is the ideal plate reader for life science applications. The Q500 is a powerful ultrasonic processor featuring programmable operation and a digital display of operating parameters. Popular applications include nanoparticle dispersion, creating emulsions, cell lysis and homogenization. The seven purpose built undergraduate laboratories maintained by the Faculty of Applied Sciences are typically used for teaching and for undergraduate students to conduct their undergraduate research project. As the only local private university that offers aquatic science and aquaculture course, UCSI University has invested heavily in its new dry and wet labs equipped with aquarium tanks ranging from one to eight feet in length. The new facility is also home to the jellyfish kreisel tank, a carefully designed circular aquarium made specifically for jellyfish and seahorses that are sensitive to water pumps or even the corners of the tank itself. This facility houses all the bacterial and fungal cultures used in research and teaching. Well-equipped to culture, store and contain microbes, the facility supports cutting – edge research in the areas of drug discovery, environmental health, food safety and antimicrobial therapies. Used for both teaching and research, this facility houses a wide range of instruments that are used to determine the physiochemical properties and sensory characteristics of food, as well as the ideal packaging for long term storage. High standards of hygiene are maintained to accurately simulate industry practices like GMP and HACCP. Equipped with an abundance of analytical instruments, this facility supports the analysis of biochemical enzymes, as well as organic and inorganic molecules. Training at the lab focuses on techniques that identify, quantify and separate components within natural and artificial materials. Specially built to culture plant and animal cells, this facility is equipped with advanced imaging technology that enables researchers to visualise the cell growth and condition. A sterile environment is maintained to house the many instruments for culturing plant and animal cells including photosynthetic growth chambers, carbon dioxide incubators and biosafety cabinets. Used primarily for teaching, this lab houses various instruments and reagents for chemical assays and analysis. Housing a freeze dryer, spectrophotometers and PCR instruments, this facility houses a wide range of research apparatus and analytical instruments. Founded in 1986, UCSI University is the flagship institution of the UCSI Group conglomerate. With campuses in Kuala Lumpur, Terengganu and Sarawak, the University comprises seven faculties, a Centre for Pre-U Studies, De Institute of Creative Arts and Design, and an Institute of Music, with more than 85 programmes in disciplines like medicine, pharmacy, architecture, engineering, computer science, liberal arts and music. As one of Malaysia’s first private universities, UCSI University has long impacted the national higher education landscape and the University continues to do so with its wide range of undergraduate and postgraduate programmes. from 110 different countries, the University stands out as a melting pot of diversity and learners will supplement their pursuit of knowledge with a keen sense of cultural appreciation – a vital trait in today’s borderless world. Over 30% of UCSI’s student population is international. Scholarships are available to top deserving students. 1 out of 5 UCSI students obtain a merit-based government scholarship or grant. UCSI University is ranked in the Top 300 Universities in Asia in 2015 by the renown QS University Rankings. UCSI is one of the few Malaysian private universities to break into the 2015 and 2016 QS Asian University Rankings. UCSI University is ranked as Excellent or Tier 5 in the SETARA 2013 rating system by MQA. 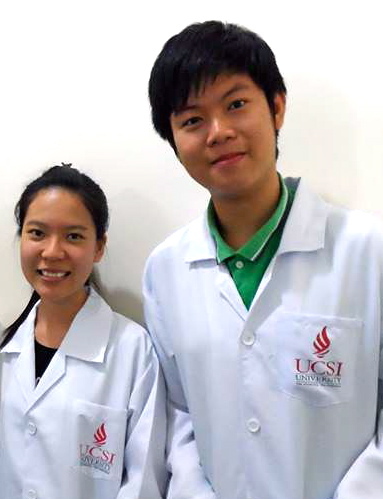 UCSI University is the first university in Asia to facilitate industry placement for students each year. Around 4000 global companies provide UCSI students with internship. And 96% of UCSI University’s Co-Op partners would like to rehire their interns when they graduate. With the number rising annually, these partnerships create job opportunities for students to be job-ready upon their graduation. UCSI University is among the Best performing comprehensive private universities in Malaysia for graduate employability. UCSI students playing basketball at the Multipurpose Hall with the Gym in the background. UCSI University operates 7 major science laboratories and several smaller research labs which are maintained by the Science Laboratories Department. Located at South Wing, the major labs include the Physical Chemistry & Molecular Biology Lab, the Project Lab, Pharmacy Practice Lab, Physiology & Pharmacology Lab, Micro Biology lab and Chemistry Labs. EduSpiral provided us with in-depth information about UCSI University and also took us around for a campus tour and to find accommodation. It really helped us to make a good decision about our future. These universities and colleges are chosen by EduSpiral because they represent the best in their fields in Malaysia and affordable. EduSpiral provides in-depth information and counseling on their courses so that students are able to make the right choice.If you are still not sure what to study, please contact us and we will send you a free EduSpiral Career Assessment Form. 1.Is it a right choice to study aquatic science? 2.Biotechnology or aquatic science which is better? Aquatic Science is a new exciting field of study with good job potential in Malaysia. Which one is better depends on many factors. You can email me at info@eduspiral.com with your full name and mobile number for more details.